The Marquesas Islands of French Polynesia were the first to be inhabited by 200BC. The next group of islands to be inhabited by migrating Polynesians were the Society Islands in 300 AD. Ferdinand Magellan - a Portuguese explorer who was working for Spain sighted the island of Puka Puka in 1521, and in 1772, Dutchman Jakob Roggeveen sighted Bora Bora in the Society Islands. Other Europeans passed through the islands, such as British explorer Samuel Wallis in 1767, and Captain James Cook in 1769, who landed in the Marquesas Islands and discovered the art of tattooing, which he brought to the West. In 1772, Domingo de Bonechea became the first European to explore all of the main islands. A short-lived settlement by Spain was established in 1774, which included Spanish Christian missionaries. The first settlement came in 1797 when missionaries from the London Missionary Society established a permanent settlement in the region. In 1842, the islands of Tahiti and Tahuatu became French protectorates, and eventually a colony by 1880. In 1889, the French united the islands in the region and called it the Establishments in Oceania. In 1946, the residents of the islands were granted French citizenship and the islands were given the status of a French overseas territory. The region's name was changed to French Polynesia in 1957. In 1977, French Polynesia was granted partial internal autonomy and in 2003, it became a full overseas collectivity. French Polynesia is a group of 5 archipelagos with a total of 118 islands. It is located in the Oceania region of the South Pacific Ocean, and found halfway between Australia and South America. The islands are a mix of low coral atolls that have elevations of 3 meters above sea level and volcanic islands. The total land area is 3,521 sq.km. and the islands are scattered over an area of 2,000km of ocean or over 4 million sq.km. 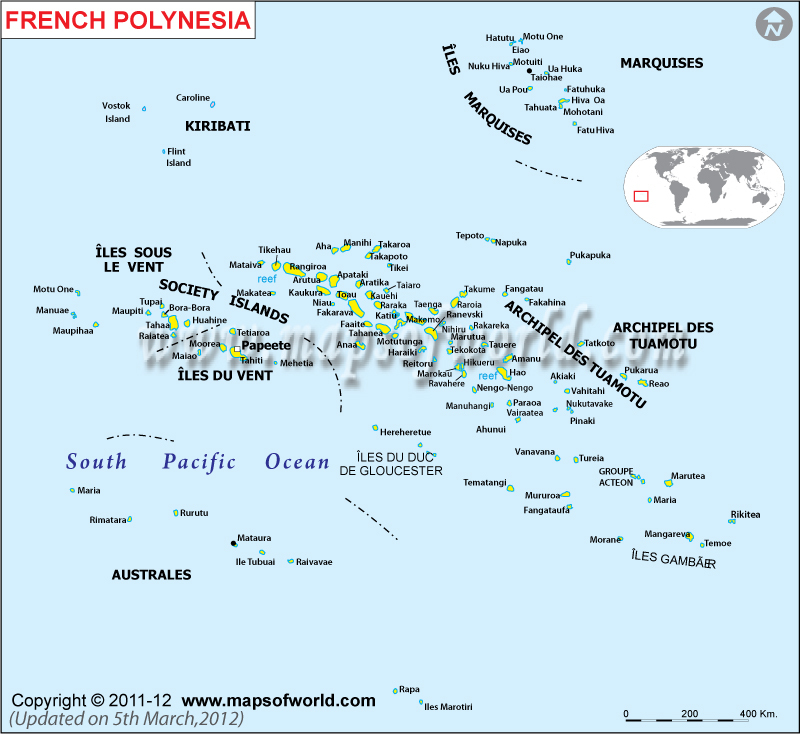 The 5 archipelagos are: Marquesas Islands, Society Islands, Tuamotu Archipelago, Austral Islands, and the Bass Islands. French Polynesia is a French overseas collectivity that works under the framework of a parliamentary representative democracy. The President of French Polynesia is the head of government and that of a multi-party system. Executive power is exercised by the government and legislative power is exercised by the government and that of the Assembly of French Polynesia, consisting of 57 members who are elected to serve a 5-year term. France has jurisdiction and is responsible for the administration of the judicial branch of government, the education system, military defense, security, and international affairs. The tourism industry in French Polynesia makes up 25% of the country's GDP, and in most of the islands, it's the sole provider of employment. The biggest island of Tahiti is the economic, political, and cultural center of French Polynesia. It is where the capital of Papeete is located, and it's famous for its markets, museums, ruins, and monuments. The interior of the island has magnificent waterfalls and the coast also offers stunning beaches of soft, white sand and crystal clear blue waters. Bora Bora is called The Romantic Island in French Polynesia and it's also the most popular of all the islands. It is home to several luxury resorts and spas, and considered to be a luxurious travel destination. Overwater bungalows are found on the coral reef-surrounded beaches. With its own airport, the island is a tourist haven for honeymooners and travelers who want to splurge. Moorea is called The Magical Island and it's considered to rival Bora Bora in terms of beauty and it's fast becoming a favorite place for honeymooners. A wide and shallow lagoon surrounds the island's mountains, and it's considered to be one of the best islands in the South Pacific. Fatu Hiva is the southernmost island of the Marquesas Islands and it is home to the region's best Polynesian tattoo artists. Local tribes here are still covered in tattoos from head to toe and it's the best place in the world to learn about the art. A hike through its lush jungle is considered to be one of the island's best tourist activities. The education system in French Polynesia is similar to that of France. French is the medium of instruction, and public primary education is free and compulsory. All public schools are financed by the government, including some private schools that are run by churches. The region's literacy rate is 98% and considered to be one of the highest among the islands in the Pacific. The art of tattooing originated in French Polynesia, and the word is derived from the Tahitian word "Tatau." Tattoos were ceremoniously applied to young boys when they reached the age of adolescence. Over half of the islands' population today is 20 years old or younger. The Tiare flower is the most mysterious in the world. Botanists have tried to replant the flower somewhere else but it only grows on Mount Temehani in the island of Raiatea.